That's the thought that was in my head when I was walking around the streets of New York after seeing Won't You Be My Neighbor?, a documentary detailing the life of Fred Rogers and his show, Mister Rogers' Neighborhood. Fred Rogers was an incredibly interesting man, but also one of the most influential father figures in all of television, both on and off screen. Generations of children grew up watching his show and learning life lessons while being treated like a human being and not just as an underdeveloped kid. I grew up watching several of his episodes, and I'm fairly certain a large majority of people here have at least seen one episode. So when a documentary about Fred Rogers gains enough traction to get a theatrical release, that's pretty spectacular. When was the last time you've heard of a documentary getting released at an AMC or a Loews? And if you go see it I can guarantee that not only will you learn a thing or two, but you may also shed a tear while doing it. 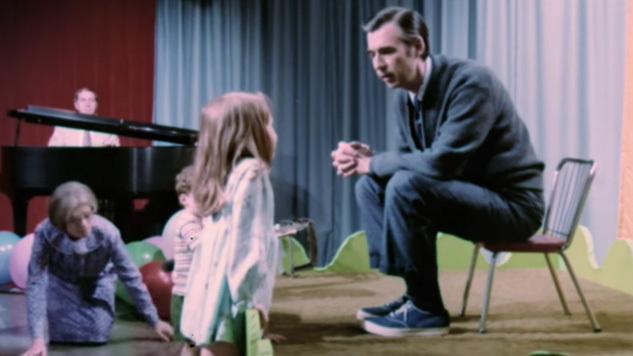 The documentary starts off with footage of Mister Rogers not on the set of his show, but in a hotel room in black-and-white explaining his philosophy on why it's so important to teach children. With that first scene, we immediately understand who Fred Rogers is and why he does what he does. We learn why he became such an advocate for children's education, using television to teach children, and instilling a sense of identity and purpose not just in children, but in adults too. We see family members talk about him, former co-workers, producers, and we even get Mister Rogers himself talking about his career before his death in 2003. If there's one thing that's pretty shocking to me about the documentary, it's that he really didn't have a dark side to him where he might be painted in a posthumously negative light. It would be so easy for a documentary to shed light on what Fred Rogers was like outside of his friendly, neighborhood persona, but the truth of the matter is that he really didn't have a negative side. The documentary briefly states that he wasn't as accepting of homosexuality as he could have been, but that's really the only negative thing to say about the man. Aside from that, based on both friends and co-workers, Mister Rogers was the same man both on and off the set, which is fascinating to watch. The documentary tries to work in chronological order, showing the show's inception until its final episode and it highlights several major episodes in particular. We see him meeting with Jeff Erlanger and singing "It's You I Like", we see him talk about how a child may think that they're a mistake, to dedicating an episode to Robert Kennedy's assassination. We even get to see his entire speech to the Senate to continue funding PBS, which is one of the highlights of the movie. If I do have an issue with the clips that they show, it's that they're usually shown out of order. After he talks about the Kennedy assassination, we jump a couple of years forward to a clip of him in the 80's, before jumping back to the 60's, then off into the 90's. The reason for this is that the documentary will jump from covering the show in chronological order to analyzing his views on television and what each of his puppets represents. It's all great to watch, but the jumpiness of the documentary makes some events hard to follow. But all of the events discussed leave a lasting impact on the audience. There's just an air of authenticity to everything that Rogers says to the point where any negative thoughts about him melt away. You might think that no man can be this sincere, but after watching him talk to you as an audience member, you can't help but feel like this man really does care about who he's talking to. Whether it's through his show or through the documentary, his words are still genuine and inspirational. Peppered throughout are simple animations of Daniel Tiger, one of the characters on the show, as a stand-in for Rogers. The animations are fine, but once you realize the parallels between him and Daniel, the movie starts to get even more interesting. As a person, Mister Rogers usually has one tone of voice but will speak in the voice of his puppets when he has to say something difficult for him. Whether it's reprimanding his kids or confiding in others about his insecurities, he'll adopt one of his puppet's voices. You can read so much into that and while the documentary doesn't delve too much into the psychological aspects of him, it's definitely a hidden layer that I loved picking apart. And then there are all of the odd stories about him that you would never have realized. Like did you know that after he took a break from Mister Roger's Neighborhood in the 70's, he went on to make an adult version of the show called Old Friends, New Friends? Or that his crew members would always goof around on set and Rogers loved to join in? And then there's more serious trivia, like how Rogers was at a loss for words for how to cover 9/11 and felt like even he couldn't say anything to help alleviate people's fears? It goes to show that even when writing this I still can't believe that Fred Rogers cares that much about people. My brain is trying to rationalize that a person can't be that perfect, but what does that say about me when I can't accept that someone is just that nice? Even as the documentary was ending, Mister Rogers asks us about who are the people that we care about and asks us to thank them. For a solid minute, I was sitting in the theatre in silence just thinking about the people that mattered most to me. The movie went completely silent too, honoring the words of Fred Rogers. People cried in the theatre, interviewees cried, and all I could think of was how effective of a documentary this was. Put everything aside for a second and just think of the world right now. Regardless of wherever you live, whether you think things are perfect or if things are terrible, Won't You Be My Neighbor? reminds the audience that you always have the potential to be kind and nice to others, and that's a message that doesn't just apply to kids. Adults can try to make other people happy too and you'll leave the theatre just feeling warm. Even if Fred Rogers is dead, his words ring true. You can be a better person and you can help those in need. And remember that you're fine the way you are and you are good enough. Those are words that I think everyone needs to hear now and then, and there's no one better to say that than Fred Rogers himself.